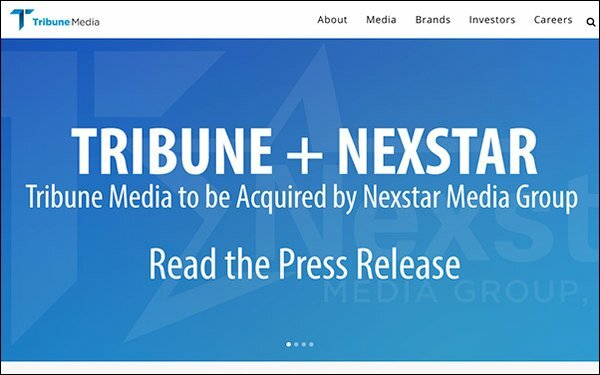 TV station group Nexstar Media Group has agreed to buy Tribune Media, another large TV station company, for $4.1 billion in cash. The deal will give a nearly 16% premium on the stock price that Tribune Media shareholders were paying for the company on November 30 -- $46.50 per share. The agreement also includes outstanding Tribune Media debt, which brings the total to $6.4 billion. This comes in the wake of a failed Sinclair Broadcast Group $3.9 billion bid earlier this year, struck down by federal regulators and eventually stopped by Tribune Media in August. Sinclair announced an agreement to merge with Tribune in May 2017. Tribune Media has 42 owned or operated local television stations, reaching about 50 million homes. Its cable network, WGN America, reaches more than 77 million households. Nexstar has 174 full-power TV stations and related digital multicast signals reaching 100 markets -- nearly 39% of all U.S. TV households, which is already at the federal regulation limit for a company owning TV stations in the U.S. The deal could make Nexstar the biggest owner of U.S. TV stations, topping Sinclair, which currently has 191 stations in 89 markets. The pact beat out a number of proposed other Tribune pursuers, including a combined deal from mid-size station group Northwest Broadcasting and buyout company Apollo Global Management. Tribune Media’s stock rose 10% on Monday to $44.26; Nexstar was up 2.7% to $84.84. Media analysts believe there could be more big TV station group deals to come.